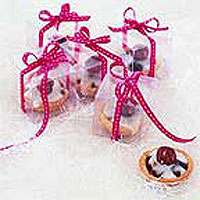 For something really special, bake a batch of these delightful mini mince pies. The melt-in-the-mouth pastry cases are generously filled with mincemeat then crowned with lemon-flavoured icing and a roasted hazelnut. They make great gifts to share with friends and family, or wrap them individually and use as stocking fillers or table decorations. Preheat the oven to 200°C, gas mark 6. Place the flour, butter, almonds, icing sugar and egg in a food processor and whizz until the mixture comes together and forms a ball. Turn out onto a lightly floured surface and knead very gently. Wrap the pastry in clingfilm and chill in the fridge for at least 30 minutes. Meanwhile, place the hazelnuts on a non-stick baking tray and roast in the oven for 5-6 minutes, or until beginning to brown. Transfer to a plate and allow to cool. Roll out the pastry on a lightly floured surface to a 3mm thickness. Cut out 36 rounds using a 6cm pastry cutter and line 3 x 12-hole mini bun tins. (You may have to re-roll the pastry to make 36 rounds, and if you only have 1 or 2 tins, make the pies in batches.) Fill each case with mincemeat. Mix the icing sugar with enough lemon juice to make a smooth paste. Cover each mince pie with icing and top with a roasted hazelnut. Allow to set before packing into boxes. The pies will keep for up to 1 week in an airtight container. To freeze, make the pies but don't bake them and freeze in the tins. Once frozen, transfer to freezer bags. To use, return to the tins and bake from frozen for 12-15 minutes at 200°C, gas mark 6, then cool and decorate as directed in Step 5. This recipe was first published in November 2003.